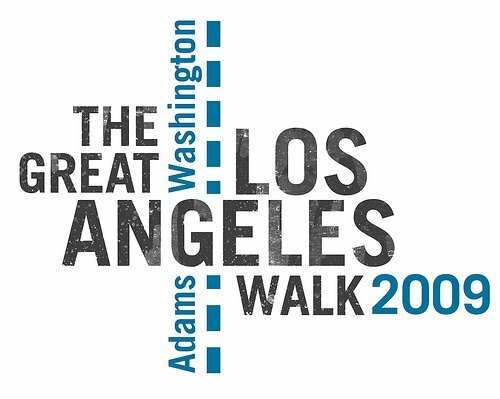 This year's annual Great Los Angeles Walk is on Saturday, November 21 and promises participants a great way to see our city. The group will begin walking south along Washington and Adams, and hike all the way to Venice Beach, with lunch in Culver City and plenty of other stops along the way. Those interested in joining this year's walk should meet at 9 a.m. on the side of Shrine Auditorium on Jefferson across from USC's Parking Lot D.
The route includes beautiful, historic sites such as the Automobile Club of Southern California headquarters, St. Vincent de Paul Roman Catholic church, and even Ray Charles's former recording studio. RSVP for this free event by emailing greatlawalk@gmail.com and check out GreatLAWalk.com for more information. On Sunday, November 1, celebrate Día de Los Muertos at El Centro Del Pueblo (1157 Lemoyne) in Echo Park. This free event will be held from 1 p.m. to 8 p.m. 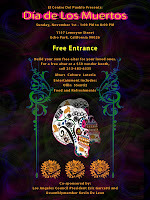 Participants will be able to enjoy food, entertainment, and building their own altar for their loved ones. This free event will feature carnival games, a teen dance for kids ages 11 to 17, and a costume parade and contest. 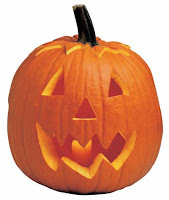 The first 150 kids between 3 and 15 years-old will receive a free trick-or-treat bag with goodies. Come to Fright Night... if you dare! 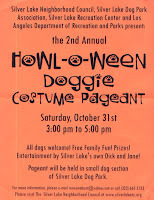 All dogs and their human companions are welcome to participate in the second annual Howl-O-Ween Doggie Costume Pageant. This fun event will take place on Saturday, October 31, from 3 p.m. to 5 p.m. at the small dog section of the Silver Lake Dog Park. It is sponsored by the Silver Lake Neighborhood Council, Silver Lake Dog Park Association, Silver Lake Recreation Center, and the Los Angeles Department of Recreation and Parks. For more information, please e-mail Renee Nahum. On Saturday we opened the brand new Police Administration Building across from City Hall. It sparkles brightly, like a gem, marking a new era in our police department's history. It's a state-of-the-art facility equipped with new technologies for modern policing, from fighting terrorism to stopping gang violence. As we open the doors on this new chapter of the LAPD, we remember what has always been at the heart of our department -- the men and women of the department who put their lives on the line everyday to protect and serve our city. In the coming years, our police department will build upon the foundation Chief Bratton has laid, applying creativity and innovation to managing through touch economic times and beyond. We will remain committed to working with Los Angeles's diverse communities, ending gang violence, and building public confidence through departmental transparency as clear as the window panels on the new headquarters. My office is coordinating a Harvest Festival in the Drew-Estara neighborhood that will be an opportunity for residents to learn more about the city services available to them. At the festival, we will be distributing canned goods to families in need. We are seeking donations of canned food. If you can contribute, please bring items to my Glassell Park Office (3750 Verdugo Road) from October 28 to November 12 between 9 a.m. and 5 p.m.
Also, if you would like to volunteer at the Harvest Festival on November 14, please contact Alejandra Marroquin at 323-957-4500. The Echo Park Historical Society will sponsor a bike ride and tour of Elysian Park's western edge on Saturday. The 90-minute tour will stay along paved roads and include several stops at points of historic interest. Riders must provide their own bikes and helmets. The tour is free for Echo Park Historical Society members and $5 for all others. Space is extremely limited, so riders are asked to reserve a spot by emailing ephs@historicechopark.org. Those who RSVP will receive more information about the tour starting time and meeting location. The LACER Afterschool Programs invites all community members to join them at Thomas Starr King Middle School (4201 Fountain Ave; 2 blocks east of Sunset Blvd) on Saturday October 31st for the Scarefest Halloween Carnival. The carnival hours are 2 p.m. to 6 p.m. and admission is free. This event for people of all ages will include games, food, contest, prizes, interactive displays, and the Haunted Maze of Fear. Come in costume -- the best one will win a prize! For more information, call 323-644-6769. The City of Los Angeles and the L.A. County Department of Public Health are hosting clinics across Los Angeles to provide free H1N1 vaccines this fall. This weekend, the vaccine will be available at a number of locations including the Chevy Chase Recreation Center in Atwater Village. Click on the flyer at right for a complete schedule. Every two weeks, new schedules will be released with additional dates and locations for November and December. On Sunday, October 25, visit the Central Traffic Division's 14th Annual "Cops for Tots" Car and Motorcycle Show at the Los Angeles Police Academy in Elysian Park. The event is a fundraiser for Cops for Tots' charities, including children's charities such as the Childrens Hospital of Los Angeles Bone Marrow Transplant (BMT) Unit. Admission is free and open to the public from 8 a.m. to 4 p.m. The show will feature vintage and specialty vehicles, live entertainment, food vendors, and displays from various LAPD Specialized Units. For more information, visit the Cops for Tots website or contact Officer Cosner or Officer Belmonte at (213) 236-9254, or by email at lapdcops4tots@hotmail.com. Help beautify Lemon Grove Park at a clean-up of the tunnel this Saturday, October 24, from 9 a.m. to 12 p.m. Volunteers are meeting at Lemon Grove Park (4959 Lemon Grove Avenue). Gloves and supplies will be available, and there will also be light snacks and refreshments. My office is working with Community Leaders in Action, which is coordinating the effort with support from the CHLA Drug-Free Communities Initiative, Home Depot-Hollywood, and the Department of Recreation and Parks to help make this event a success. Today, Governor Schwarzenegger signed emergency legislation restoring $16.3 million in state funding for 94 domestic violence shelters and centers throughout California. After Governor Schwarzenegger cut $20.4 million from the state's Domestic Violence Program in July, the effects were devastating. One case, here in LA, is especially jarring. A victim of domestic violence finally sought help at a domestic violence shelter after years of abuse, only to find that the shelter had closed due to lack of funding. When she returned home that night, she shot and killed her husband. If the shelter had been open, her story probably would have been different. I'm glad to know that domestic violence shelters will be able to reopen their doors, providing emergency shelter, transitional housing, legal advocacy, and many other critical support services. LED street lights are replacing existing fixtures in Hollywood as part of a pilot program. The LED lights use 40 percent less energy than our existing lights, reducing maintenance and energy costs and reducing carbon dioxide emissions. The Bureau of Street Lighting is testing fixtures from more than a dozen manufacturers. Ultimately, the city will replace 140,000 street lights with the LED fixtures, which will reduce carbon dioxide emission by 40,500 tons (the equivalent of taking 6,700 cars off the road) and save $10 million annually. You can check out the LED fixtures along Camerford, Waring, and Gregory Avenues between El Centro and Gower. Requests from non-profit organizations to be added to the Big Sunday Holiday Volunteering and Giving Opportunities List are being accepted through October 23 at 5 p.m. The annual list is a compilation of opportunities for people who want to volunteer or give to a good cause during the holiday season. It will be posted online and sent to Big Sunday's email list on November 1. This is a great way to get the word out about your organization's needs during this busy time. Examples of events and needs that have been included on previous lists are: providing Thanksgiving dinner to battered women, giving gifts to homeless kids, and singing to seniors on Hanukkah. 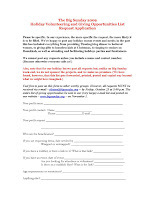 The application is pictured at right (click on it to enlarge it). You can also email Big Sunday for more information. The Echo Park Advisory Board will meet on Monday, October 19, at 7 p.m. at the Echo Park Recreation Center (1632 Bellevue Avenue). Items on the agenda include Echo Park Fright Night and the Echo Park Lake rehabilitation project. 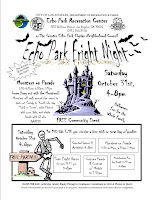 For more information, please contact the Echo Park Recreation Center at 213-250-3578. On Saturday, November 7, join my office for a Community Clean-Up and Resource Fair. The clean-up will begin at 8 a.m. Volunteers will meet at Virgil Village Park (Madison Avenue at Middlebury) to pick up trash in the neighborhood until 10 a.m. The resource fair will begin at 9 a.m. Representatives of City Departments will be available to answer questions and provide information about the many services available to local residents. Entertainment and refreshments will be provided! For more information or to RSVP, please contact my East Hollywood Field Deputy, Aida Alvarado, at 323-957-4500. This Friday, October 16, come celebrate the third anniversary of the Echo Park Farmers' Market with a Good Cooking/Buena Cocina demonstration that will feature free samples from 4 p.m. to 6 p.m. The market itself will be open during its regular hours of 3 p.m. to 7 p.m. Free carrot cake from La Boulangerie will be served at 6 p.m. The Echo Park Farmers' Market is located in the parking lot off Logan Street, just south of Sunset Boulevard. On Saturday, October 17, join the East Hollywood community in celebrating the young artists whose works now adorn utility boxes around the neighborhood. Lead artists Jose Lozano and Gloria Alvarez along with youth mentor January Sanalak will be part of this reception at Barnsdall Junior Art Center (4814 Hollywood Blvd.) beginning at 3:30 p.m.
Project partners include the East Hollywood Neighborhood Council, Barnsdall Junior Art Center, Hollywood Youth and Family Center, Thai CDC, Armenian Center for the Arts, AT&T, St. Garabed Church, John Marshall High School Art Department, Helen Bernstein High School Art Department, Rose and Alex Pilibos School Art Department, UCLA, and the City of Los Angeles. Funding came from the James Irvine Foundation, Dwight Stuart Youth Foundation, and Black Rock Arts Foundation. This event is free and open to the public, so come support L.A.'s up-and-coming young artists! College graduates earn an average of $1 million more over their lifetimes than those with just a high school diploma, but a college education is expensive. To help you plan and prepare for college, Cash For College is hosting a Family Night from 5:30 p.m. to 9 p.m. on Wednesday, October 28, at the Los Angeles Convention Center, South Hall (1201 S. Figueroa Street). Admission is FREE for everyone, and families with students in middle and high school are especially encouraged to attend. The convention will focus on topics such as how to pay for college, creating a college-going environment in your home, and college access regardless of immigration status. Los Angeles's trunk line is about to get an upgrade thanks to $10 million in federal economic recovery dollars awarded to the City's Department of Water and Power to replace an aging portion. 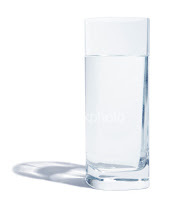 The project will help ensure a reliable supply of water for DWP customers and help the us meet state and federal health and environmental standards. The grant will also generate more than 600 private sector jobs. 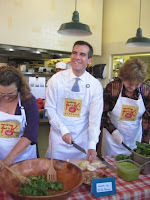 This morning I helped launch the Farmer's Kitchen, a project of Sustainable Economic Enterprises of Los Angeles (SEE-LA). The new facility located in the Sunset + Vine complex (at the corner of Selma Avenue and Morningside Court) provides new jobs, food-industry job training, and free nutrition and cooking classes. It also provides a more permanent presence for the 18 year-old Hollywood Farmer’s Market (operated by SEE-LA), and supports local farmers by canning and bottling unsold produce. The Hollywood Community Redevelopment Agency of the City of Los Angeles (CRA/LA) provided financial support for this program, which also received a grant from the U.S. Department of Agriculture and funding from private donors. Check it out in Hollywood! For hours of operation and more information, click here. U.S. Housing and Urban Development (HUD) Secretary Shaun Donovan will give the keynote address at the 2009 Mayoral Housing, Transportation and Jobs summit on Friday, October 30. This annual event hosted by the Los Angeles Business Council will also feature panels with key elected and appointed officials, and business and community leaders. I'm looking forward to emceeing the summit and seeing Los Angeles's own Mercedes Marquez, who is now the Assistant Secretary for Community Planning at HUD and will be speaking about President Obama's housing policy. For more information or to register for the summit, click here. This year, AFI FEST 2009 presented by Audi is offering free tickets to all festival movies, including a limited number of free tickets to evening red carpet galas. This year's festival runs from October 30 through November 5 at Hollywood's Grauman's Chinese Theatre and Mann Chinese 6. Free tickets will be available online starting October 16 at AFI.com/AFIFEST or by calling 1-866-AFI-FEST. You can also obtain tickets by going to the Festival Box Office that will be located in the Mann Chinese 6 main lobby starting on October 26. Tickets for same-day screenings will also be available via rush lines. On November 7, join HomeWalk, a non-competitive 5k walk hosted by the United Way of Greater Los Angeles to raise awareness of and funds for local efforts to end homelessness. The walk begins at 9 a.m. at Exposition Park in South Los Angeles and anyone can register for free as an individual or part of a team (PATH Partners has formed one!) by clicking here. LAPD Northeast area's annual community open house will be held on Saturday, October 17, from 10 a.m. to 3 p.m.
Bring your family to tour the station (3353 San Fernando Road) and meet local officers and command staff. You will be able to view displays of SWAT, Bomb Squad, Narcotics, K-9 Unit, Air Support, and Mounted Unit. 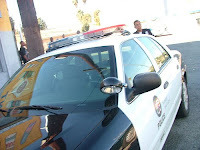 You will also be able to learn more about how you can get involved as a member of the Volunteer Surveillance Team or how your kids can become involved with the LAPD Explorer program. This Halloween, the Olympic Division of the Los Angeles Police Department is hosting a carnival and haunted house. Come to the Olympic station (1130 S. Vermont Ave.) for an unforgettably spooky weekend, October 23 through 25. The carnival will be held Friday from 4 p.m. to 10 p.m., and Saturday and Sunday from noon to 10 p.m. The haunted house will be open Friday through Sunday from 6 p.m. to 10 p.m. The Hollywood Wilshire YMCA's annual Comedy for Kids event will be held at the Music Box at Fonda (6126 Hollywood Blvd.) on Sunday, October 18, at 8:00 p.m. This event brings together a host of acclaimed comics for an entertaining evening of stand-up comedy in support of a great cause. Past talent has included: Tim Allen, Jay Leno, George Lopez, Caroline Rhea, Ray Romano, and Patricia Heaton. For more information or to purchase tickets, please contact Kitty Gordillo at (213) 639-7542. This week, my Glassell Park office will be a repository where you can bring donations to help victims of Typhoon Ondoy that flooded Manila, killing hundreds and displacing hundreds of thousands. Major relief efforts are underway in the Philippines, but they are not sufficient to support victims' needs for long. Food, sanitation, and medical supplies are low. More resources are desperately needed. Monday, October 5, 1 p.m. - 4 p.m.
Tuesday, October 6, 1 p.m. - 4 p.m.
Wednesday, October 7, 10 a.m. - 4 p.m.
Thursday, October 8, 10 a.m. - 4 p.m.
Friday, October 9, 10 a.m. - 4 p.m.
For more information, please contact Ryan Carpio at 323-957-4500. During the closure, access to the library's online catalog, materials circulation (check-in/check-out), and the materials reservation system will be unavailable. The upgrade to the online catalog/circulation system will allow the LA Public Library to provide better online services in the coming years. This morning I joined with a broad, multi-partisan coalition of state leaders in showing unity for California's application for federal funding of a high-speed train system. We submitted a request for $4.7 billion in federal stimulus dollars to engineer, design, and build high-speed rail in the Golden State. This project will generate more than 100,000 jobs and provide an alternative mode of transportation for residents and visitors. We held our press conference and rally in support of California's high-speed rail application at Union Station, where one of the high-speed train facilities would be located. President Obama has visited this iconic train station a few times, and I am hopeful that his Administration will look favorably on California's efforts to move this project forward. 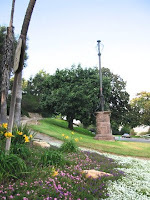 The Silver Lake Improvement Association will present the 15th Annual Music Box Steps Day on Saturday, October 17. SLIA, which founded the annual event, will also be celebrating its 20th anniversary. Come join the fun from 12 p.m. to 3 p.m. at Laurel and Hardy Park (between 923 and 935 Vendome Street). 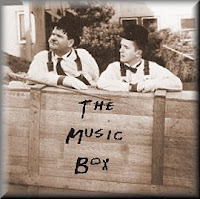 There will be free food, Laurel and Hardy look-alikes, live entertainment, a raffle, and a screening of the 1932 Oscar-winning short, The Music Box. The 133 steps that gave comedic geniuses Laurel and Hardy such a hilariously hard time are a historic part of Silver Lake, and this children's film festival will keep its memory alive.